Nine reefs were surveyed in this sector. Sector-wide hard coral cover was moderate. Six reefs were previously surveyed in 2017, after the major bleaching event in 2016. Between 2017 and 2019, hard coral cover declined on five of those reefs and was unchanged on one. Three previously unsurveyed reefs had low, moderate and high coral cover and their inclusion contributed to the 7% increase in sector-wide hard coral cover between 2017 and 2019. One crown-of-thorns starfish was recorded at one reef. Coral bleaching was widespread, but at low levels (scattered, individual colonies). Recent storm damage on some reefs was likely due to Tropical Cyclone Penny in early January 2019. Figure 1: Map showing location of reefs in the Cape Grenville sector. As part of the Long Term Monitoring Program (LTMP), manta tow surveys of hard coral cover and the abundance of the coral feeding crown-of-thorns starfish (COTS), Acanthaster cf. solaris were completed on nine reefs in the Cape Grenville sector of the Great Barrier Reef (GBR) (Fig 1). Preliminary results of the manta tow surveys are presented in Tables 1 and 2. The overall median hard coral cover for the sector was moderate (10-30 %) (Table 1) and had increased since 2017 (Fig 2). The sector-wide increase in hard coral cover reflects changes to the sampling regime, rather than increases in hard coral cover due to recovery from bleaching. Five reefs that were surveyed in 2017 could not be surveyed in 2019 due to safety concerns (crocodiles). These reefs were inshore/mid-shelf reefs and had low hard coral cover in 2017 following the 2016 bleaching event. Of the reefs that were previously surveyed, hard coral cover remained moderate (10 to 30%) on Curd Reef, but had declined on the five reefs in the Middle Banks and Ashmore Banks since 2017 where hard coral cover remained high (30-50%). The cause of this decline was most likely coral bleaching in 2016 and 2017, and recent storm damage from Tropical Cyclone Penny in January 2019. Of the reefs surveyed for the first time in 2019, median reef-wide hard coral cover was high (30 to 50%) at Lagoon Reef, moderate (10 to 30%) at Mantis Reef and low (0 to 10%) Reef 11-049 (Table 2). One COTS was observed at Reef 11-049, however all reefs were classified as No Outbreak (Table 2). Scuba surveys of fixed transects recorded low levels of coral bleaching but observations during manta tow surveys indicated localised areas where up to 10% of hard coral cover was bleached, likely caused by exposure to above-average sea temperatures in December 2018. Cases of coral disease were low on all reefs as were numbers of the corallivorous snail, Drupella spp. Coral juveniles were observed in multiple size classes at densities likely to support future reef recovery. Details of the manta tow method can be found in the Standard Operational Procedure No. 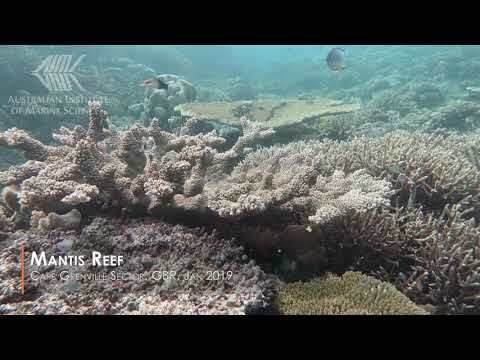 9 [AIMS Research - Crown-of-thorns Starfish and Coral Surveys - Standard Operational Procedure 9]. Further details of the monitoring program design, sampling methods and a full explanation of the A. solaris outbreak terminology can be found on the AIMS website. *Note: genetic studies show that there are at least four species of COTS. These are the North and South Indian Ocean species (A. planci and A. mauritiensis), a Red Sea species (not yet named) and a Pacific species. The range of the Pacific includes the Great Barrier Reef and it has been provisionally named Acanthaster solaris (Haszprunar et. al. 2017). Table 2: Summary of manta tow surveys of reefs in the Cape Grenville sector. Arrows indicate the trend in live coral cover and A. solaris since last survey; ▲ = increase, ▼ = decrease, " " = no change. Outbreak Status: NO no outbreak, IO incipient outbreak >.22 COTS per tow, RE recovering, AO = Active Outbreak >1 COTS per tow. Click here for further details of the monitoring program design, sampling methods and a full explanation of the A. solaris outbreak terminology. Subscribe to get the latest survey updates.